At first, you thought it was a plague. Then you thought maybe it's an after-school special. It's a front row seat for the end of worlds! Worlds of the Dead is the first Deadworlds collection for the All Flesh Must Be Eaten roleplaying game of survival horror. Inside this rancid tome, Zombie Masters will uncover everything needed to push their players to the edge of survival-on a weekly basis! 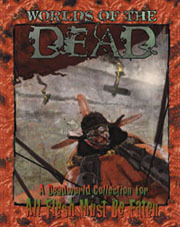 Worlds of the Dead is filled from cover to tainted cover with Deadworlds from a variety of authors. We've drawn from industry professionals, up-and-coming talents, and never-before devoured acts. Then we sent them to run amuck with the dead! Whether you need a world ready-to-play for an unexpected session, fresh ideas for your own vile plots, or that feeling of power being in control of several thousand zombies all at once, Worlds of the Dead keeps on coming . . . just like the walking dead it features. • A world where WWI flying aces face off against an evil, undead, Red Baron over the skies of France. • A world where necromancers control the future of your death. • A world of ancient deserts where the dead refuse to remain buried beneath the sands.